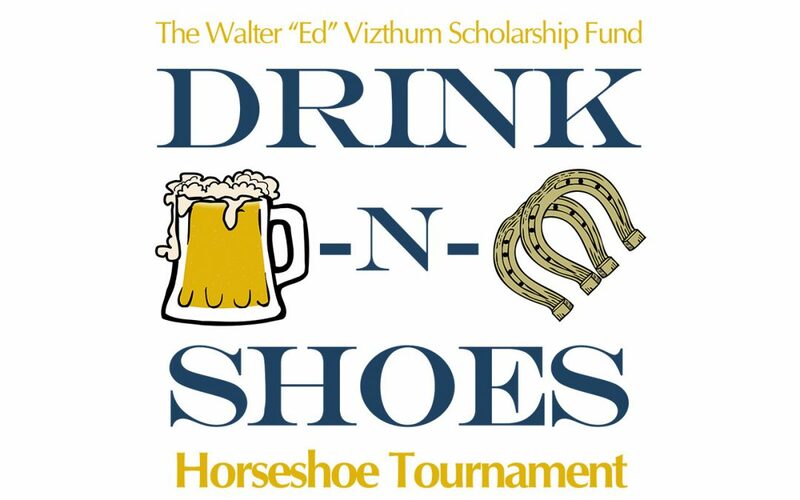 To all of our players, thank you for registering for the inaugural Drink ‘N’ Shoes horseshoe tournament presented by the Walter “Ed” Vizthum Scholarship Fund. Below is a list of thing you will need to know for tomorrow’s event. Please arrive on time. Limited parking is available in the main lot. Additional parking can be found along Jerome avenue and adjacent side streets. A T-shirt, food, entertainment and a wristband that provides entrance to the beef and beer are included with your registration. Beer tickets are available for purchase (1 for $3, 2 for $5) your first beer is on us. We have a prize raffle available with tons of great prizes, as well as a 50-50. There is an ATM on site but this event is cash only. Additional T-shirts and beef and beer only tickets can be purchased online until midnight tonight. Beef and beer only tickets are available on-site throughout the day for $25 cash. Children ages 5-12 will be admitted for $10 children 4 and under are admitted free. We have taken attempts to make this event as safe as possible, but horseshoes present a danger and we ask that any children be closely supervised. Gameplay will follow the National Horseshoe Pitchers Association rules for horseshoes as closely as possible. Please remember this event is all for a charity and games are being played on the honor system. Point disputes that need a third party perspective are asked to approach the main table for an official ruling. 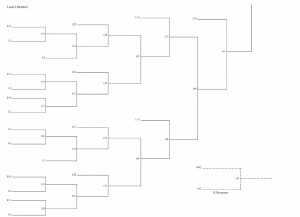 This is a double elimination tournament meaning each team must lose two games in order to be eliminated. The game is divided into innings. Each inning consists of four pitched shoes; two by each contestant. Alternate first pitch is used to guarantee each team an equal amount of first and second pitches during a game. Each team will alternate who pitches first. Rock, paper, scissors will be used to determine which team pitches first. One team shall pitch first in innings 1, 4, 5, 8, 9 and 12 while the other team shall pitch first in innings 2, 3, 6, 7, 10 and 11. Rounds 11 and 12 are tiebreaker rounds that will be played if necessary. Games are scored to 21 points or limited to 10 innings of play, whichever occurs first Each team is asked to designate a scorekeeper for each game. After one team scores 21 points or the 10-inning limit passes, the team with the highest score advances. Again we ask that the honor system is to be followed at this time. Ringer – 3 points – A ringer is a shoe which comes to rest encircling the stake. A straight edge touching both points or any part of the heel calks of the shoe must clear (not touch) the stake in order for a shoe to be declared a ringer. A ringer has a value of three points. Leaner – 1 point – A live shoe that comes to rest vertically while touching the stake. This shoe has a scoring value of one point. Shoe in Count – 1 point – A shoe which is not a ringer but comes to rest with any portion of it within 6 inches of any part of the stake is a shoe-in count. A shoe-in count has a value of one point. Any other shoe which is touching the stake (but not a leaner), is considered a shoe-in count and has a value of one point. Scoring is calculated using the count-all scoring method. 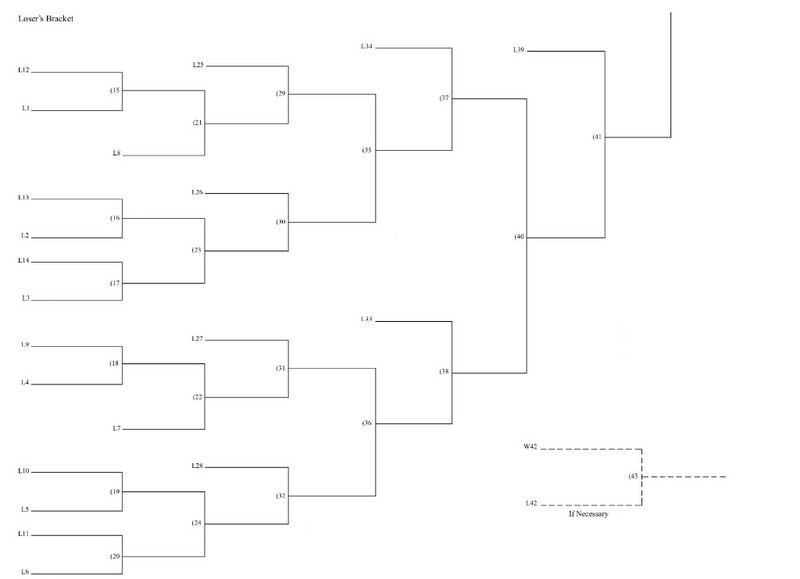 One player from each team on one side will throw two horseshoes per round and after each player has thrown points will be totaled for each team. 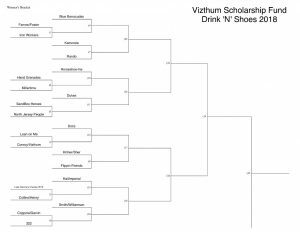 Both contestants receive credit for all of their shoes that are scored in each inning. If after 10 innings the two teams are tied a two-inning tie-breaker shall be played, using the same method of play that was used in the game. If the tie is still not broken, a pitch-off will be conducted. Each player will pitch two shoes up and two shoes down solely to determine who wins. If the contestant is not present within 5 minutes of the start of a game and has no special approval from a tournament official or their opponent, they will forfeit the game. If it is not your turn to pitch, please stand as far behind the pitching box as possible. If you trying to determine the score of an inning, please be aware that other people will be playing around you. Keep your heads up and if possible, have someone on your team keep an eye open for errant shoes. If you are not playing, please do stand in the playing area. Winners from the top three teams will all receive trophies. Winners will be announced and trophies will be awarded shortly after the conclusion of the tournament. Beef and beer entry includes a buffet style lunch with your choice of roast beef, burgers, hot dogs and sides. DJ Jerry McGee will be in attendance from noon-4 p.m. to provide music for the party. The bartender, Natalie, is volunteering her time for the event. Please remember to tip your bartenders and be courteous to the Margate Log Cabin which is donating its space and staff. Please consider following our page and the Drink ‘n’ Shoes event on Facebook. You can also follow us @VizFund on Instagram and Twitter. 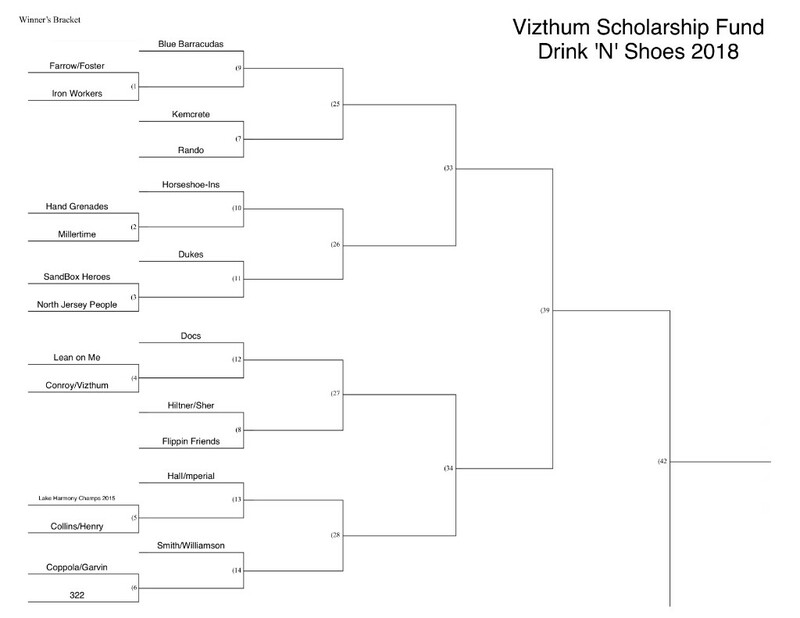 You can also use the #DrinkNShoes. 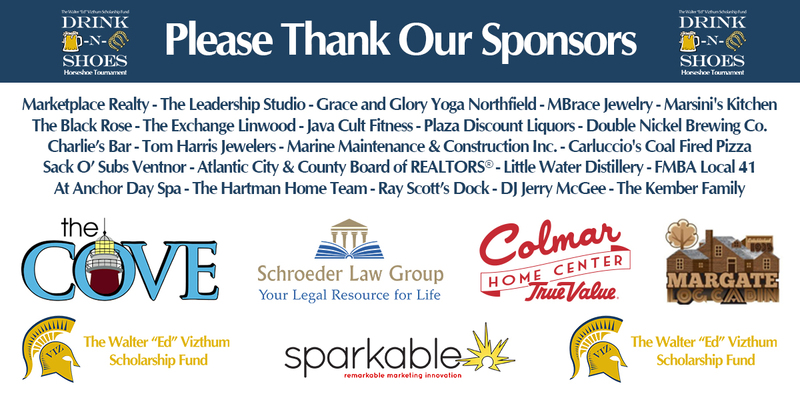 All of our local sponsors have been very generous in donating their time, money, goods and services to our event. Please support these local businesses who have helped to make this all possible.